Doing a little mugging during a walk. We have our own exercise bike at home. Skating was the first thing I gave up after my lungs became damaged when I was 11. I loved nothing more than to skate...and skate fast. And I would skate until it was time for me to come home. The first time I tried to skate when I was supposedly recovered, after several weeks of battling what was diagnosed as pneumonia, I returned home after only a few minutes. I couldn't understand how I could be so exhausted already. I tried a few more times, but those attempts ended the same way. I didn't yet know that I my lungs had been permanently damage, so I thought I would eventually take it up again after I fully recovered. The bike went next. I could barely pedal up the slightest of inclines, so I was walking the bike more than I was riding it. I thought I would return to the bike one day too. I was still sickly for years after that, and there's a lot we may never know about what was happening to me. I suspect there was still some continuing disease process involved. But the exercising I've been forced to do for my coma and stroke recovery has shown me how much strength I could've maintained if only I hadn't completely given up my formerly active lifestyle. I didn't appreciate the profound impact of inactivity. 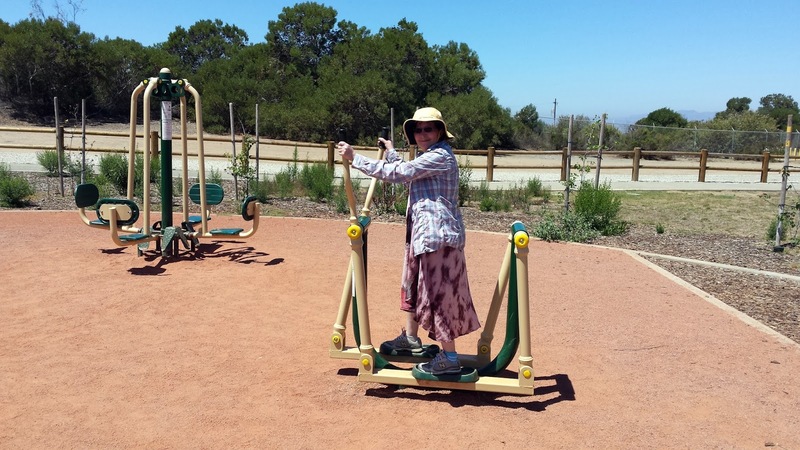 After my lung damage was diagnosed, the physical therapist I was assigned by Children's Hospital gave me aerobic exercise program to build my endurance back. But the PT greatly overestimated my ability. I could barely make it through the warm-up exercises, and that reinforced the idea of my new weakness in my mind. I think I can't. I think I can't. Even though I'm much stronger now, I still have difficulty with that kind of fast, sustained, vigorous exercise. Perhaps it has to do with the nature of my lung damage, which was later worsened by my two Legionnaires' disease bouts and repeated pneumonias. I've always known that I could improve my stamina by exercising, but I never realized how much until I was forced to do it. Not being able to walk is a great motivator. The home physical therapist I was assigned after I left the nursing home used to take me for walks around our street. I liked Alan a lot more than I did walking along the suburban street. He advised me and Keith to find somewhere to walk. That was the best rehab advice he could've given me. I never would've built the endurance I now have by walking in our neighborhood. It's way too boring. We started walking in the Sepulveda Basin Wildlife Reserve, with its abundance of Pacific Flyway birds, and branched out to various gardens. My attitude changed, as I began to push myself to walk ever farther. Though I was pushing myself because I knew it would help my recovery, I never would've gotten as far as I have if weren't also enjoying myself. Spinning is less fun, but we make the time pass by playing lectures from the Teaching Company. I love learning. Instead of concentrating on how tired I feel, I focus on the absorbing the information. When we can't watch a lecture, the time passes slowly and it begins to feel like a slog. Hopefully, most people won't need Legionnairesacise to motivate them. But I think my experience holds some lessons for the people who haven't been through the kind of medical traumas I have. It's not that exercising is too hard; it's just that you're weaker than you think. I can't emphasize enough how weak inactivity can make you. According to research, it only takes a few weeks for muscle atrophy to begin. Make the exercise fun. Don't pick an exercise routine just because it's trendy or simply because you think it would be good for you. If it feels like torture, you'll eventually quit. If I had been assigned the exercise program I have now--fun, gradually advancing, and sustainable--I would've been much more likely to actually have stuck with it. In short, do what I do now, not what I did!